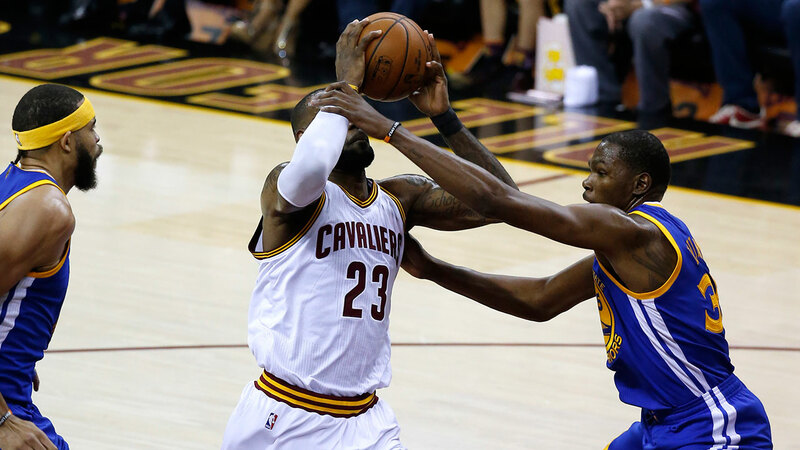 CLEVELAND (KABC) -- The Golden State Warriors continued their historic unbeaten romp through the NBA postseason, winning 118-113 in Game 3 of the Finals against the Cavaliers in Cleveland. Game 4 is Friday on ABC7. Kevin Durant made a go-ahead 3-pointer with 45 seconds left to give the Warriors the lead. Durant scored 31 points and Klay Thompson had 30 for the Warriors, who improved to 15-0 in the postseason and are on the brink of the first undefeated finish in the NBA. Stephen Curry had 26 points, 13 rebounds and six assists. LeBron James had 39 points, 11 rebounds and nine assists for the Cavaliers, and Kyrie Irving added 38 points. Blown out in the first two games, the Cavaliers were much better in Game 3, but just not good enough to beat a team that could go down as one of the best ever. The Warriors have already made history this postseason. Their 15-0 record makes them the first team to go on such an unbeaten playoff streak in any of the major sports. Kevin Durant: 3rd player to score at least 25 points in his first 8 NBA Finals games. Now at 87-15, they also have the potential to finish with the second-best single-season winning percentage in NBA history, including regular season and playoffs. The 1995-96 Chicago Bulls went 87-13, which the Warriors cannot mathematically beat this year. The current No. 2 is the Los Angeles Lakers, who sent 81-16 in 1971-72. The previous NBA postseason record of 13 straight wins had been set by Los Angeles in 1988-89 and matched by the Cleveland Cavaliers in 2016-17. The victory is also the Warriors' 30th in their last 31 games, dating to the regular season. Five NBA teams didn't win 30 games all season. And with a win in Game 4 on Friday night, Golden State can exorcise those haunting demons from last year when the Warriors blew a 3-1 lead in the Finals to the Cavaliers. No team has ever overcome a 3-0 deficit. Klay Thompson added 30 points and Stephen Curry 26 for this California Dream Team now one win from its second title in three years. LeBron James shook off a knee-buckling blow to the chin and every Golden State shot while scoring 39 and Kyrie Irving added 38 for the Cavs, who took a 113-107 lead with 3:09 left on J.R. Smith's 3-pointer. Curry hit a layup and after both James and Irving missed for the Cavs, Durant dropped his 3 - a shot that could be the one most remembered in this magnificent run by the Warriors. "All I was looking at was the bottom of the net," Durant said. "I've been working on that shot my whole life. To see that go in, that was liberating, man. We've got one more to go."